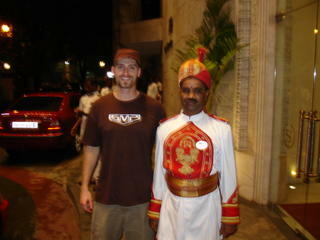 Well India has come and gone but the sights and smells are still circulating in my head. It took me almost three weeks to get used to the crazy time difference, laying in bed wide awake at 4AM everynight thinking about home and the chillies became a habit when I could have been just having another dark rum and coke...damn! The more I come back to reality here in the peg the more I realize how lazy and lucky we are, I passed a construction site here that made me laugh: three white guys with safety shoes and vests on watching another white guy in a bobcat dig a hole. The reason that is funny? You might be telling yourself ya so that is what I see all the time! India had to dig holes to, but it looked a little different: 50 people, most with barefeet, digging with hand tools and putting everything into large metal bowls on top of their heads to move it ten feet across the street. No bobcat, no safety shoes, no one watching the white guy work just watching the white guy with his jaw on the floor staring back at them thinking how lazy his own people are in Canada. All this for about 40 rupees a day if they are lucky. Find out for yourself how much that really is and remember that when you buy the XL double double from timmys. One thing I do appreciate is the willingness to have a rum each night when the sun goes down, the smooth buttery goodness of Old Monk and coke makes for such nice mellow night I can't wait to start importing it to Winnipeg.